It's February! Which means Valentine's Day is around the corner; and in France, we never miss an opportunity to celebrate love. Valentine's Day is the perfect time to show your special ones how much you care about them; and what a better way to show your appreciation than by baking some delicious French yogurt cookies! 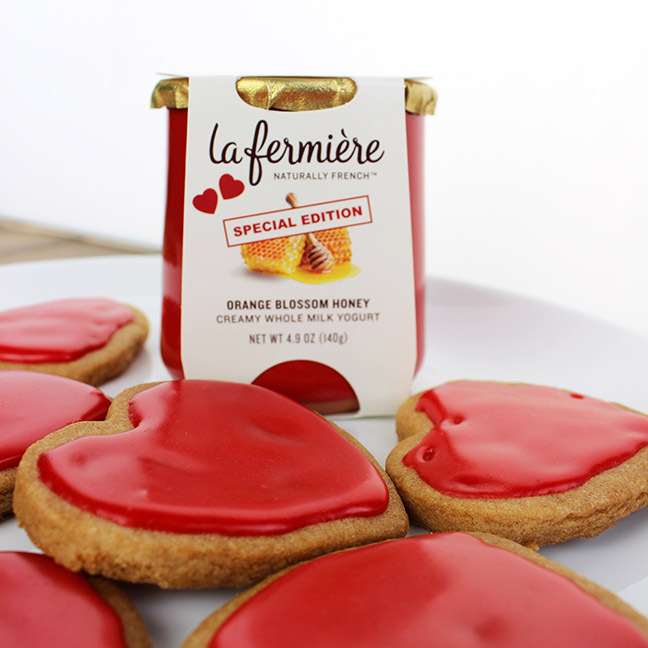 These cookies will delight and warm hearts with their subtle taste of honey from incorporating our Orange Blossom Honey flavor yogurt. Whether it be family, close friends or a significant other; these cookies will not disappoint! To recreate, follow these simple steps outlined below. ½ Cup La Fermière Orange Blossom Honey yogurt. (1) Preheat the oven to 350° F and line two baking sheets with parchment paper. (2) In a bowl, mix together the flour, salt, and baking powder and set aside. In a stand mixer fitted with the paddle attachment, cream the butter and sugar at medium-high speed until light and fluffy, about 3 minutes. Beat in the eggs, one at a time, then beat in the vanilla. Add the yogurt and dry ingredients in two or three alternating batches and mix until just combined. (3) On a floured surface, roll out the dough. Use a heart shaped cookie cutter to cut out heart shapes. Place on baking sheets, each one inch apart. (4) Bake until the bottoms are just beginning to brown, about 18 minutes. Let the cookies cool on the sheets for 5 minutes, then transfer them to a wire rack to cool completely. Decorate them with a desired icing!